Ex-lawyer Rodney Hylton-Potts won ITV's reality Vote For Me show with his "cabbie's manifesto", which includes policies to deport immigrants and castrate paedophiles. Would cab drivers - often cited as a good barometer of grass roots feeling - vote for him? "We're capitalists, the smallest version of capitalists you can find," says taxi driver Alan Parker, as he weaves his vehicle through the central London traffic, heading north to Hampstead. Alan, a cabbie for 35 years, is seeking to isolate what it is about the capital's black cab drivers that has earned them such a legendary reputation for being right wing loudmouths. "We're self-employed," he says of his 24,000 colleagues, "each one of us a sole trader, a small businessman if you like." In popular folklore, the cabbie's credo does not fit the profile of any one political party, but goes something like this: Europe - one big gravy train; criminals - lock 'em up and throw away the key; government - nannying overlords; business leaders - fat cats; single mothers - spongers; asylum seekers - foreign spongers, and so on and so forth. Cabbies, both in London and elsewhere, are not alone in holding passionate views about how to put the world to rights. But unlike the rest of us, the ranting taxi driver is always blessed with a ready audience: the paying passenger. This potent combination of hard-edged rightist politics and a willingness to spout them at every opportunity seems to have inspired Rodney Hylton-Potts, winner of ITV's Vote for Me. The show, which ran last week, was a Pop Idol-style contest in which viewers voted for budding MPs. Mr Hylton-Potts, a convicted fraudster and former solicitor, won on a manifesto that included halting immigration, the mandatory castration of paedophiles, the repeal of the Human Rights Act, the legalisation of all drugs and a massive prison-building scheme. 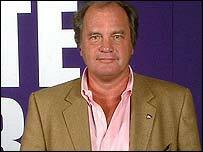 "I won because of what I call the cabbie vote," Mr Hylton-Potts said later, describing how his polices had been influenced by the cab drivers who drove him to and from the studios during the making of the show. 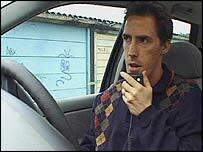 "I think cabbies are a very good guide. When I told them my views, every single one of them said 'Good on you, mate'." It's not just Mr Hylton-Potts who lumps cabbies into a particular political class. The Guardian's Polly Toynbee once blamed Britain's "taxi driver tendency" for public scepticism about helping poor countries. What about cabbies themselves? Will they be queuing up to vote for Mr Hylton-Potts come general election day? Alan Parker, who mixes his cabbing work with teaching a course in London's history at City University, thinks not. Cab drivers represent a broad spectrum of backgrounds and political opinion he says, before admitting he falls into the politically conservative fold. "I'm a Tory and have been all my life but at the last general election I voted UK Independence Party," he says. Leon Reefe, a black cab driver for 25 years, and a Labour councillor, is offended by Mr Hylton-Potts' pigeonholing. "It's total rubbish. Nothing could be further from the truth, but the myth persists because it's put about by the media. To tar us all with the same brush is highly insulting." Mr Reefe says the stereotype of the white, working class, often Jewish, London cabbie is changing fast, as black people, Asians and those from the Far East join the ranks. Nevertheless, he admits there is a definite tendency for his colleagues to lean to the right - something he blames on former Labour Home Secretary Merlyn Rees' repeated refusal to increase the cabbie's tariff during the 1970s. So what is it about the cabbie's wisdom that seems to make such a big impression? Taxi trade is often taken as an indication of wider economic factors - in short, the more free cabs there are cruising the streets of London, the less money we have in our pockets. It means the humble cabbie is at the sharp edge of any changes in the economy. Malcolm Linskey, a former cabbie who has written histories of the London cab trade, says a combination of being one's own boss coupled with the rigours of The Knowledge - a tough entry exam that all London black cab drivers must pass - gives cabbies oodles of self-confidence. "It makes them stroppy, free-thinkers, argumentative. They answer to nobody but themselves and that comes across in their conversation. "Everyone wants to play them as fascists but it's a myth. It's just that those who are on the right will tend to speak their minds. The others keep their politics to themselves." What do taxi drivers think of the "cabbie's manifesto"? [Hylton-Potts] was a bit extreme. He talked some sense but he went too far. Probably a lot of cabbies are on the right. We see all sides of life. Cab drivers are maligned as xenophobes. It doesn't go for all of us. We might have our finger on the pulse, but that doesn't mean we're extreme. I'm a Tory. You talk to most people in a cab - they all think the same, as do all people who live in the real world. We're paying for scumbags. He's made some good points there, but he doesn't speak for me. There's an element of taxi drivers who are to the right of Genghis Khan.